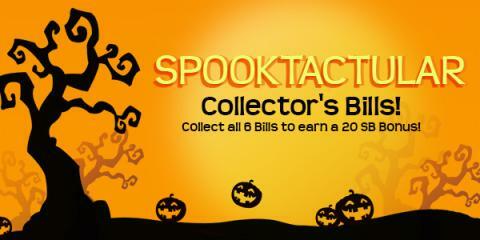 Swagbucks is celebrating Halloween with a special set of Spooktacular Collector's Bills! When you get a Collector's Bill you'll receive the value of the bill and the bill will be added to your Collector's Bills ledger. Collect all 6 Collector's Bills and you'll instantly earn a 20 SB Bonus!